tom ndege and Jorgik like this. I have so fallen off the painting wagon.... I also moved this is my excuse. Good to see you're still keeping track of it though... get settled and then pick up your brush again! Hopefully, I have my paints and some projects need to set up a new place to work. The eyes of the great slann blink. It seems an eternity has passed, yet for the ancient slann it was but the blink of an eye. The new temple is still mainly deserted of skinks and saurus attendants but the presence of great Huanchi is palpable. As the attendants continue the process of of turning the ruined pyramid into a thriving home a feral bastilladon is being trained a relic of the rise of sotek has been unearthed, and scouts have been sent looking for terradon eggs as the nesting season is soon upon us. Hi everyone, I'm back to painting. Nice highlights on those scales. Those scales are beautiful. You can't go wrong with either of them. Not to mention the cat, which has to be the most realistic paint job I have seen to date. Looks so life like! Lord Agragax of Lunaxoatl, Aginor and Crowsfoot like this. You do a quick test in an hour or so and you don't realise how long its going to take on the full model . So I went with the brown scale design I played with in the last post its just a base coat, shade and 3 layers.... should take no time at all.... haha. I also painted grouping of snakes to test out the blue on chocolate I wanted to play with so here have snek pic. Here's where I leave off today. The brown and blue go well, are you building it with the crystal, what colour? I like that brown basti! Actually things are coming together nicely if I just highlight the blue skin now.. yeah. Sometimes I think I'm my harshest critic but it really came together. I'm like 95% done with the blastiladon just the skinks, sneks and poles left. tom ndege and Warden like this. I dunno, he looks fantastic to me! 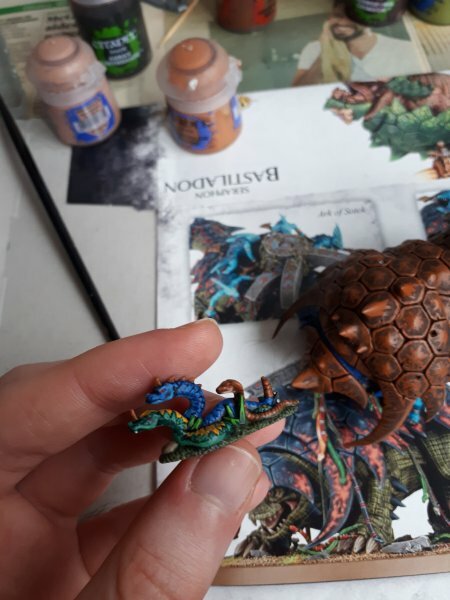 Really like how much the bastie's shell looks like an actual turtle shell, well done! I also really like how these snakes turned out, you really brought out all that tiny detail. Tiny details that's my name! ... unrelated my painting desk needs a new lamp. I'm actually really liking it but I had these jitters all the way through that it wasn't going to turn out.